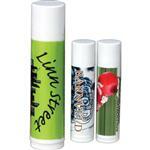 This custom trade show promotional lip balm will treat you to a little shine. 100% natural and will bring joy to dry lips. Put your logo on an item people will not only keep with them, but keep coming back for more! This is a super silky sweet moist lip shimmer, and it is fully customizable with your slogan, logo, and photo! Contains all natural ingredients including: Organic palm oil, beeswax, flavor or essential oil and vitamin E and a hint of peppermint. Copper Drop, Ruby, Red, Polished Pink, Sparkling Wine and Sheer. Organic palm oil, beeswax, flavor or essential oil and vitamin E and a hint of peppermint.